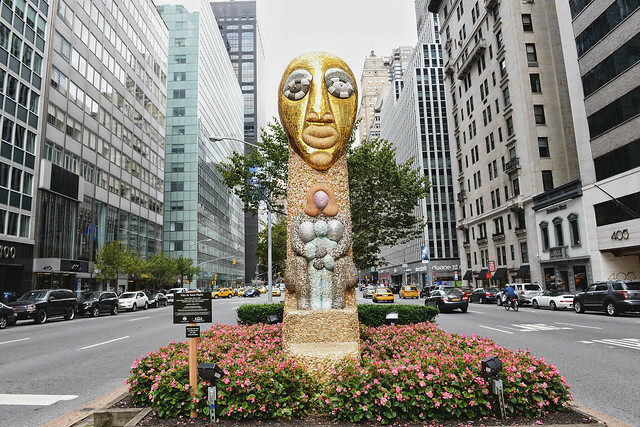 A few weeks ago, I was riding my bike down Park Avenue when I saw the sculpture of a very colourful, bulbous lady in the middle of the avenue. 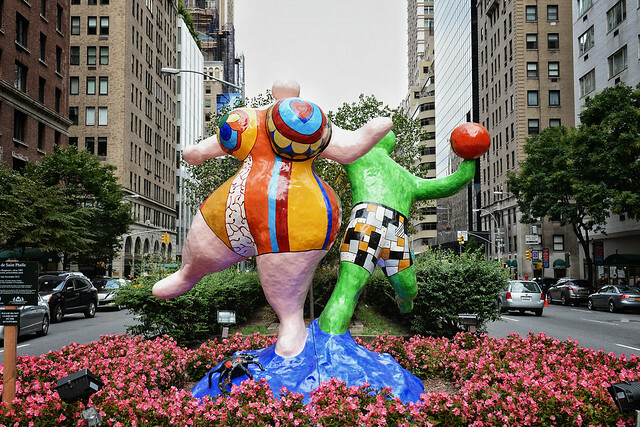 It was of course one of Niki de Saint Phalle’s famous ‘Nanas’ and part of an outdoor exhibit of the artist’s work, commemorating the 10th anniversary of her death. 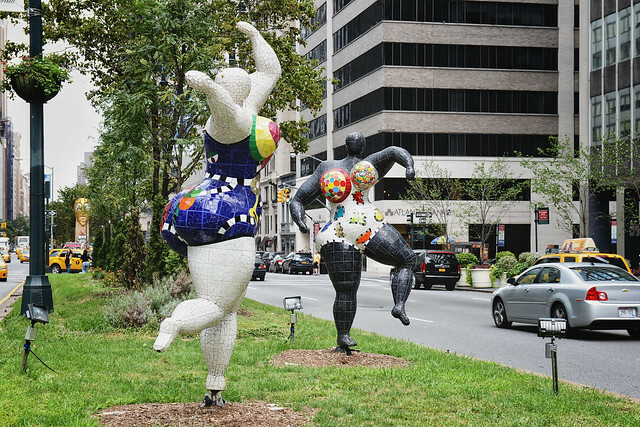 I have been familiar with Niki de Saint Phalle’s voluptuous sculptures for a while. In Luxembourg, where I grew up, La Temperance (based on the tarot card Temperance) presides over one of the city’s central squares, brightening the place up on a dreary day. 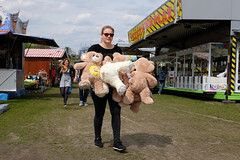 We commonly refer to her as ‘the fat lady’. 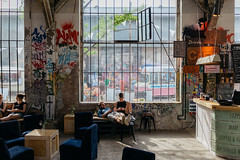 My favorite, however, is the massive Schutzengel (Guardian Angel) who hangs serenely from the ceiling of Zurich train station, protecting the travellers as they pass through the city. 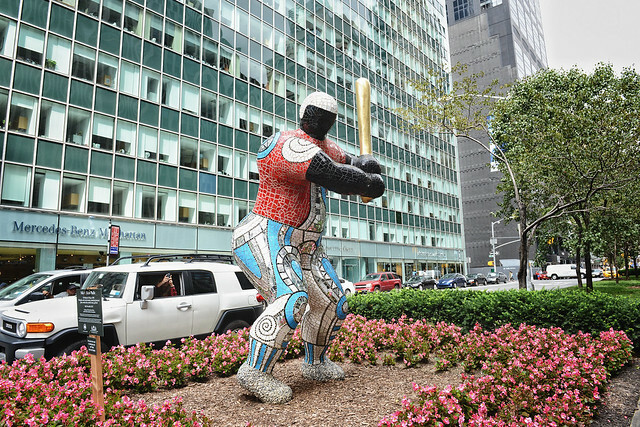 Although her gleeful, larger-than-life women are probably what Niki de Saint Phalle is best known for, the Park Avenue installation features a mix of music- and sports-related sculptures. 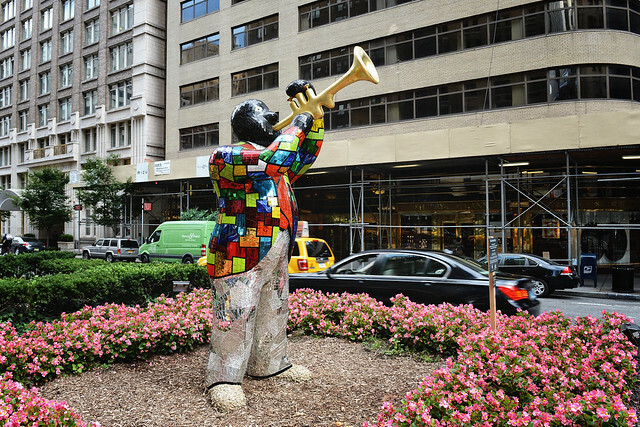 Les Trois Graces (The Three Graces) dance to the music of Louis Armstrong and Miles Davis, both of whom are wearing brightly-coloured jackets, mosaics of stained and mirrored glass. They are joined further down the street by #23, Michael Jordan performing a lay-up, and #19, a baseball player who I assume is famous! 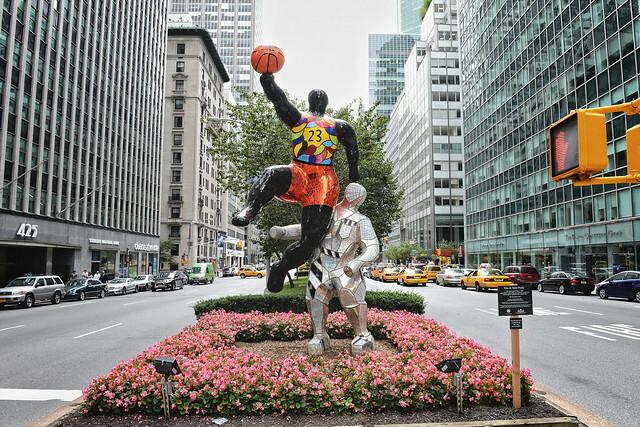 While the sculptures may not be to everyone’s taste, they do bring a vibrant feel to Park Avenue. 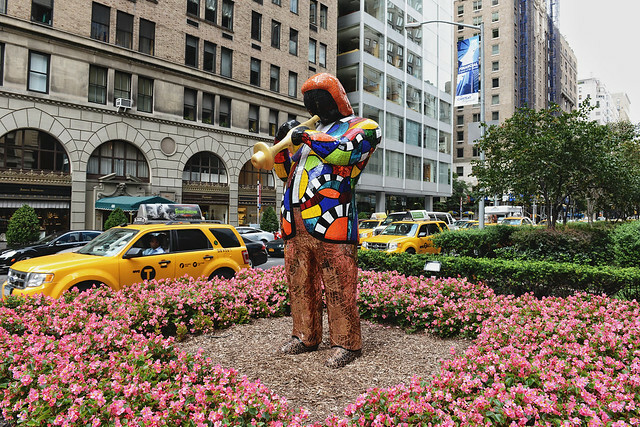 The colors are vivid and eye-catching from afar and the festive theme of musicians, dancers and bathers seems to represent New York City as a playground. 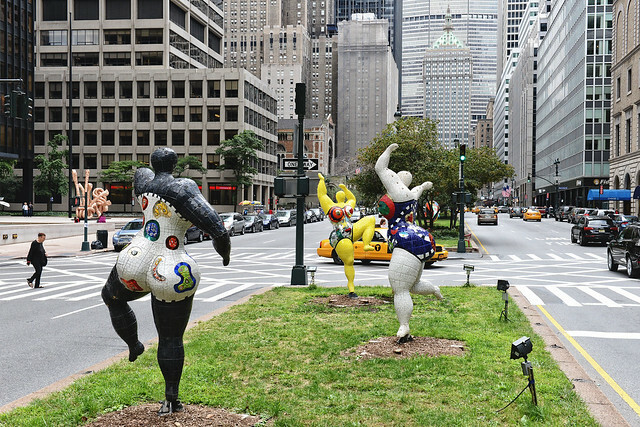 The Niki de Saint Phalle sculptures will be on display until mid-November. Hopefully they will also be able to keep our spirits up as winter approaches.